Vice President Mike Pence visited Calexico in Imperial County yesterday to inspect efforts to revamp and expand the U.S.-Mexico border wall. His visit, while almost 100 miles away, coincided with the caravan arrival over the weekend of some 200 would-be asylum seekers at the U.S.-Mexico border in Tijuana. U.S. Customs and Border Protection is replacing roughly two miles of of Vietnam War-era landing mats in Calexico with 30-foot tall bollards, which the agency describes as hollow steel posts filled with concrete and steel rods. CBP is also replacing 14 miles of landing mat barriers in San Diego and 20 miles of vehicle fencing in Santa Teresa, New Mexico with bollards. Although the Calexico work was planned before President Donald Trump entered office, strengthening and expanding fencing along the southern border was one of his major campaign promises. Speaking to immigration enforcement agents in Calexico, Pence called the wall an enforcement aid, as well as the “physical manifestation” of a commitment to border security. “Let me make you a promise. When it comes to the border wall, we are going to build it all,” Pence said. The immigrants were also victims of human smugglers and drug cartels, Pence said. Photos earlier today captured caravan immigrants sitting atop the barrier near San Ysidro. Many seeking asylum were refused entry to the United States because border officials said there was no space to accommodate them. Scores continued to wait on the Mexican side of the border today. In November, inewsource and KPBS created “America’s Wall,” a uniquely detailed look at the current barriers between the two countries. In light of Pence’s visit, here are some key findings from that project that highlight the impact of the wall and its impact on illegal immigration..
Calexico, in the El Centro Border Patrol sector, has almost 44 miles of pedestrian fencing and about 15 miles of vehicle barriers along 71 miles of the border. It is a small portion of the 653 miles of fencing along the 1,954-mile southern border. Overall, the fencing includes 353 miles of barriers intended to stop people on foot, such as steel walls and landing mats, as well as about 300 miles of vehicle barriers. The landing mats in Calexico that are being replaced were installed in 1996 and 1999. That means they’re old compared to the rest of the current wall. About 90 percent of the overall wall was built since 2005 during the administrations of two presidents: Republican George W. Bush and Democrat Barack Obama. The El Centro sector includes pedestrian and vehicle barriers, but it doesn’t include secondary fencing. There are about 37 miles of secondary fencing along the border backing up the main wall. Primarily used in urban border areas, such as San Diego and El Paso, barriers create a kind of no man’s land where it is easier for Border Patrol agents to spot individuals entering the country illegally. To better understand the impact of new fencing on illegal entry, inewsource and KPBS analyzed the impact it had on illegal entry. We found that generally, wherever new fencing was built, illegal immigration declined. However, it didn’t stop. Instead, migrants moved around the wall to frequently more dangerous parts of the border. For example, in 1995 less than 3 percent of apprehensions for illegal entry happened in the El Centro sector. But as stricter enforcement and new fencing made the San Diego and El Paso sectors harder to enter, illegal immigration shifted toward El Centro. By 2000, more than 14 percent of southern border apprehensions were in the El Centro sector, which translated to about 238,000 people. Over time, the El Centro sector was replaced by Arizona and Texas as a popular destination for illegal entry. In fiscal 2017 only about 6 percent of apprehensions – about 18,600 people – occurred in the El Centro sector. 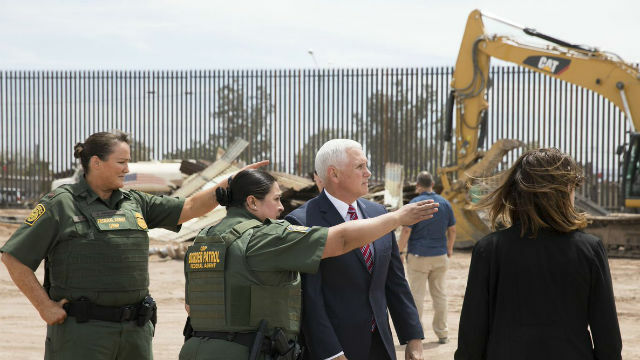 In February, Pence visited the Rio Grande Valley border sector in Texas, accompanied by Homeland Security Secretary Kirstjen Nielsen and Senator Ted Cruz. That sector has been the most active for illegal entry in recent years. More than 45 percent of apprehensions occurred there in fiscal year 2017. Texas is the state with the fewest miles of fencing, despite sharing the longest southern border with Mexico. The Rio Grande and property disputes have made expanding the wall there challenging. Still, Customs and Border Protection is planning 25 miles of new levee fencing and and eight miles of new bollard barriers in the Rio Grande Valley sector. Overall, illegal immigration has reached the lowest levels in decades. In fiscal year 2017, Border Patrol agents apprehended about 304,000 people for illegal entry, the fewest since 1971.